1) CCBoot clients with Client Cache enabled can greatly reduce these pressures, For client with 2GB memory, cache can be set to 512M, client with 1GB memory, cache can be set to 128-256M (We recommend client have at least 2GB of memory as 1GB of RAM is not enough to cache and run Windows OS (Windows 7 and above client RAM - 2GB+ recommended)). 2) CCBoot support multiple disks as write-back, hence using more than one writeback has lot of benefits, such as: if one writeback disk fails client will continue to work and use the working disk as writeback disk. Similarly, two writeback disk will be able to handle more writebacks from the client. Normally, a SATA hard drive can support up 20 clients writebacks with sufficient writeback cache. 3) We recommend using SSD disk for writeback disk as its is able to handle large read/writes compared to normal SATA Harddisk. It also give your client more performance as it will be able to read/write at faster speed than on HDD. 4) The disk configuration you use for game disk also impacts the server load. And using cache you can reduce much load from the game disk. We recommend setting up 2 HDD in RAID 0 and set large memory cache, it will now only improve the read speed, it will also lessen the time for the client to load the games. 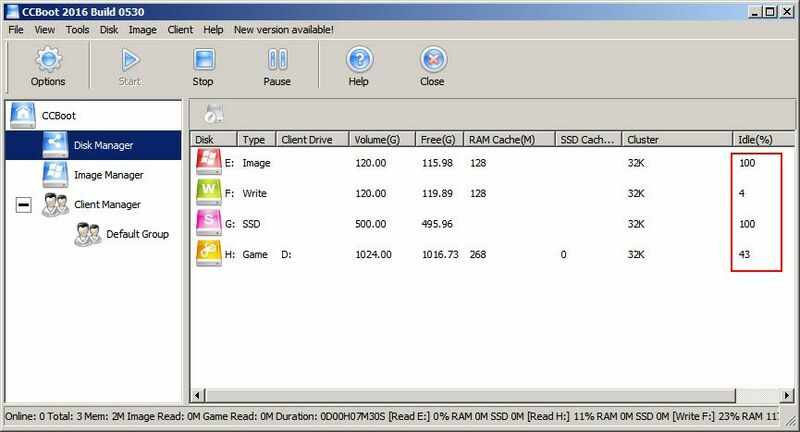 Paired with our SSD Cache technology games on client load even faster compared to traditional HDD. Server state, how to determine which disk overload. Easiest way to determine disk overload is to monitor the performance of the writeback disk and Game disk on CCBoot Server, Disk manager. If the idle (%) of either disk is less than 30% for long period of time then its overloaded. (So consider adding another writeback disk) (Figure 1). In short, read and writes of the clients determine the pressure on server disk. Hence, its better to have two disk if your writeback disk is overloaded. Similarly, you need to set sufficient RAM Cache for disks so read/writes can be caches. Also if you client have 2GB RAM then set client cache to 512MB so client will cache read/write data and still have RAM to play normal games. This way you offload some of client writeback from server to the client cache.